A Community Conversation on Education, Responsibility & Accountability. This overview course will address the basic steps to building a successful, continuous prospecting program. Donors indicate their willingness to become further engaged through hints more than by stating their intentions outright. In this session, you will learn how to build a few alert systems to catch those hints as they come in. In addition, the session wraps up with a simple exercise in basic statistics that will get you started in finding patterns (and therefore high-level donors) in your database. Bring an Excel-compatible (Excel 2007) workbook with 10 prescribed fields and at least 250 records (I’ll define the fields by email before the conference). You will examine your data on the spot, taking action steps back to your shop. We will walk a short distance to the Dragon’s Den on campus (cash only). This session addresses the individual responsibilities of fundraising research in organizations, focusing on the most pressing and stressing aspects of this role and its accountability. Where do I begin? What information is imperative for profiles? What are the best resources for me to use? How do I begin to search and how do I know when to end? How do I know what prospective donors hold the most potential? What factors should I consider for inclination and financial capacity? How do I begin to create or maintain a rating system for financial capacity and inclination? How do I formulate a suggested solicitation amount? How do I best format my analysis for a ‘quick read?’ How do I stop the world from spinning? This session is for those who wish to be pro-active and shine in their organization, while remaining sane during the process. 2:45 p.m. How Much Is That Donor on the Spreadsheet? Segmenting our prospect pools (or lists if we don't yet have prospect pools) is perhaps the most important task a researcher can undertake. But how do we value prospects on our lists -- as individuals and as a group? This session will talk about the role of research in providing both a macro snap shot of prospect pools as well as the how-tos of providing individual ratings for prospects. Find the Prospect Pot of Gold! Marianne Pelletier, CFRE is currently serving as the Director of Advancement Research and Data Support at Cornell University where she is working on a $4 billion dollar campaign — the most ambitious campaign in Cornell University’s history. Marianne has been in the fundraising field since 1988, when she joined the research team at Harvard's University Development Office. Previously she has served as a researcher for Lesley University and Carnegie Mellon University and as Director of Annual Giving and Development Services for Southern New Hampshire University. Marianne has also worked with Datatel’s clients on the Benefactor product. Marianne is the Board President of APRA-UNY. She is an associate with the Helen Brown Group and serves as a key member of the Group’s data mining services team. She has a bachelor’s degree from Rockford College and an MBA from Southern New Hampshire University. Deborah Reinhardt Youmans is Director for Advancement Research at Le Moyne College, where she also teaches a freshman elective, Philanthropic Perspectives: Generational Differences. On a pro bono basis, she serves as an independent consultant for small nonprofit agencies in the Central New York area. She is an APRA board member and serves on the Education/Professional Development, Nominations and Ethics committees. She is a member of the National Association for Fund Raising Professionals, Central New York Association for Fund Raising Professionals, National Committee on Planned Giving, and the Planned Giving Council of Upstate New York. Deborah has been a presenter at numerous national, regional and local conferences for APRA, AFP, MARC, NEDRA and CASE, where she earned the faculty star rating. She has served as President of APRA-Upstate New York, board member for the New England Development Research Association, APRA 2008 Conference Curriculum Committee, MARC 2007 Conference Chair, NEDRA 2006 Co-Conference Chair, MARC 2006 Marketing Chair and APRA 2005 Research Fundamentals Track Chair. She holds an MBA from Le Moyne College and bachelor’s degrees in business administration and psychology from Columbia College. David Shanton joined Baruch College in 2005 as Executive Director of Development, where he oversees the annual fund, leadership giving, alumni relations, advancement research and services, and special events. He also served as Acting Vice President of College Advancement at Baruch from September 2008 to February 2009. Previously, David was a senior consultant with Marts & Lundy for three years, assisting nearly 75 clients throughout the country with their diverse fund raising needs. He began his development career at St. John’s University where he spent 13 years and established the University's first leadership giving society, first reunion giving program, first prospect research program, first systematic stewardship program for endowed funds, first prospect identification program, and first prospect tracking and management program. Along with his strong background in prospect identification, research and management, David also has strong experience in building leadership gifts and reunion giving programs. David has been an active member of several professional associations and served on the APRA Board of Directors from 2003 to 2009. He has also served as vice president and membership director of APRA Greater New York (1997-2001), and as an APRA Foundation Board Trustee (2001). A prolific speaker, David has given presentations at conferences for CASE, the Association of Fundraising Professionals (AFP), the Foundation Center, The King Baudouin Foundation United States and APRA. David is a graduate of Utica College and received his MA degree from the Eagleton Institute of Politics at Rutgers University. He also received an MLS degree from St. John’s University. Registrations greatly appreciated by March 15th but accepted at the door. You will receive an email confirmation notice from APRA-UNY upon receipt of your conference registration and payment. The Central New York Community Foundation connects the generosity of donors with community needs by making grants to organizations working to enhance the quality of life of those who live and work in Central New York. The Community Foundation annually makes more than $5 million in grants and provides leadership support in the fields of arts and culture, community and economic development, education, environment, health and human services. Founded in 1927, the Community Foundation strives to inspire philanthropy in Central New York. The Central New York Community Foundation is an equal opportunity employer and encourages applications from candidates of all races and ethnic backgrounds. The Grants Associate position is an entry-level position expected to work closely with other program staff and other Community Foundation staff to manage the grantmaking activities of CNYCF, ensuring that funds are thoughtfully, fairly and equitably distributed. The job responsibilities fall into four main areas: grant specific activities, such as reviewing and monitoring proposals; ascertainment activities, such as conducting literature searches and/or interviews on a particular issue; community relations, such as interacting with prospective applicants and representing CNYCF in philanthropic groups and community meetings; and, administrative/program support. 1. Grant Proposal Processing and Analysis – Process all grant applications. Maintain applicants’ files. Prepare reviewers packets. Enter appropriate grant data in system. Analyze grant applications. Provide summary information to staff in appropriate format. Follow up with grantees regarding outstanding information. Participate in review and analysis of proposals through written materials, site visits, interviews with other funders and relevant agencies. 2. Grant Monitoring and Management – Assist Grants Manager and other program staff in monitoring grants, including progress reports, payment schedules and other related correspondence and meetings with grantees. Monitors and reports regularly on proposals and the grant process including grant agreements, progress reports, payment requests, and other related correspondence. 3. Project Research Support – Conduct research on issues or concerns of importance to the Foundation – through written materials, interviews, community meetings, computer networks, or other useful vehicles. Present findings in written and oral formats. 4. Community Relations – In collaboration with program team, works directly with grantseekers to provide clarification of community foundation priorities, direction regarding application procedures, and feedback on proposals. Communicates with grantees as needed. Participates in outreach activities as requested during and outside regular business hours. 5. Administrative – Provide support to all staff with office management tasks, event planning and various projects. Assist program staff in the implementation of special projects for the Foundation, ensuring thoughtful and reasonable process, timely preparation and coordination of key activities and materials for committees and Board meetings. Work as a member of multidisciplinary team to ensure the effective and efficient operations of the Foundation. Inputs data and maintains grant database and constituent management database. Maintain program filing systems. The Grants Associate occasionally manages incoming phone calls in the absence of the Administrative Assistant. 6. Other duties as assigned, dependent on organizational needs and employee skills. 1. A minimum Bachelor’s degree or equivalent experience. 2. A minimum of three years experience working with or in a nonprofit agency. 3. Demonstrated ability to organize and coordinate several activities at one time. 4. Solid computer literacy in Microsoft Office and database management. 5. Strong analytic, interpersonal and networking skills. Able to interact with grantseekers, Board members, donors, and Foundation staff from diverse backgrounds. Strong team player. 6. Excellent communication skills, both written and oral. 8. Familiarity with the Central New York area, its opportunities and challenges. 9. Good sense of self with demonstrated qualities of integrity, loyalty, discretion and self-motivation. 10. Deep interest in and love for the work of the Central New York Community Foundation. This is a full-time position. Salary is dependent on experience. Employee benefits include individual health insurance, term life insurance, additional disability insurance, parking, and a voluntary 403(b) program with employer match. 3) Your salary history for the past five years and your salary requirements. Would you like to improve your community? Make sure you are counted, and that your neighborhood receives its fair share of funding for schools, programs and services you use every day. Join Senator Dave Valesky for a Census 2010 Town Hall meeting to find out about the important benefits of being counted. Census Representatives will also be on hand to discuss Census job opportunities. The CNY Business Journal reported that the boards of the Metropolitan Development Association of Syracuse and Central New York and the Greater Syracuse Chamber of Commerce have both approved a proposed merger of the two groups. The MDA board voted today and the chamber board on Jan. 25. Both votes were unanimous. The full membership of both organizations will vote on the plan Feb. 18. NPR's The Two-Way blog featured a recent post by Frank James about an article in the Wall Street Journal discussing how the victims of the recession have been non-profit groups, many of which has as their mission helping, among others, victims of the recession. The Wall Street Journal reports that non-profits that relied on the kindness of strangers in order to house the homeless, feed the hungry or provide educational opportunities for low-income students have themselves fallen on hard times. The post goes on to relate that the WSJ reports that the positive development is that weak nonprofits are closing their doors, while other nonprofits are merging. Read more here. Although many have their own reactions to this WSJ article and the NPR post, mergers and collaborations are an important option for nonprofits to consider, and more and more organizations are doing so. Have questions about mergers, or how your nonprofit can receive information and assistance? 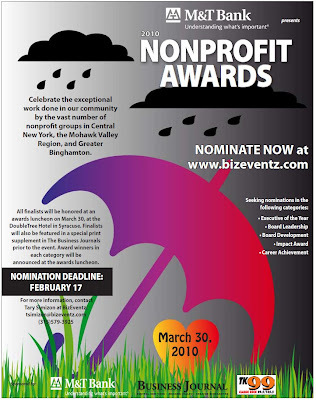 Visit the NY Council of Nonprofits or e-mail us.